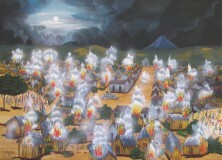 Oscar Eduardo Peren was born in 1950 in San Juan Comalapa, Guatemala. 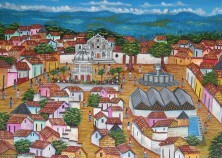 He is one of the leading painters of the “Comalapa School”. He paints in the Kaqchicel Community (constituting 96% of the population). Comalapa School is known for organization, placement and relation of figures; geometric design, a sense of balance; often bands of figures in processions, parades, funerals and celebrations. Legends and his father’s story-telling inspired Oscar Peren from an early age. He is self taught; he creates subjects out of proportion and has transmitted his artistic knowledge to his sons and daughters.